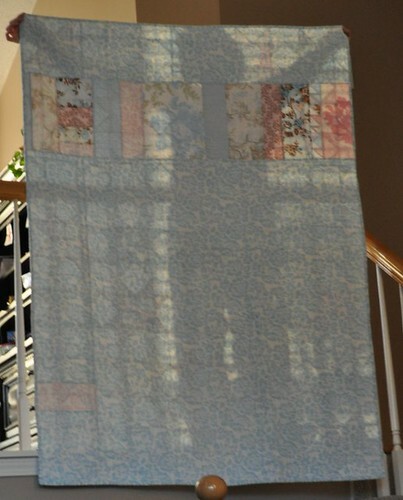 here are the quilts I've been meaning to show you. 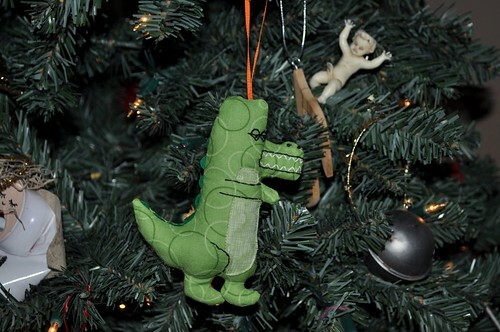 These are ones I really think I have to make in 2010. 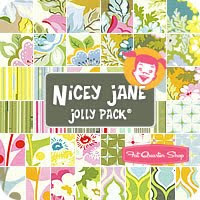 I found these while browsing Amy's fall quilt festival. 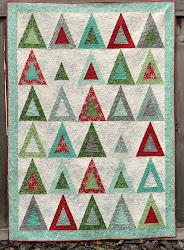 (I still haven't finished looking at all the quilts! 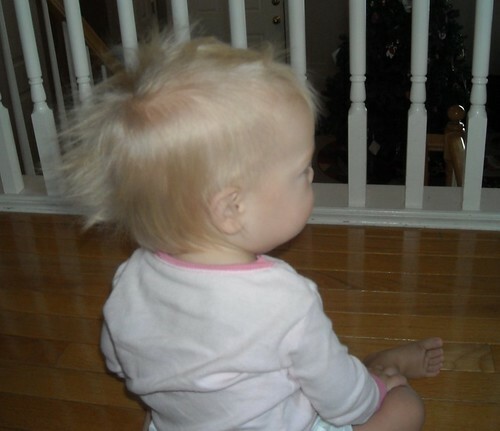 I've got to work on that.) 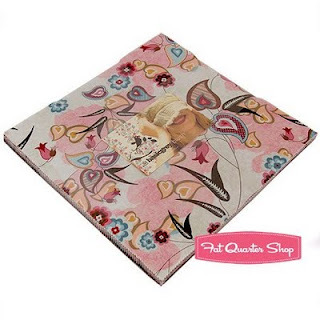 The first one is this amazing picnic quilt from Fancy That. Aren't those just the best colors? And I love the denim. 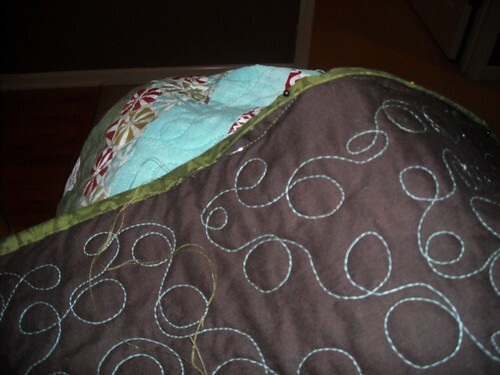 The second one is the roundabout quilt from A Commonplace Life. I love the circles and all the bright colors. And how the circles are offset. 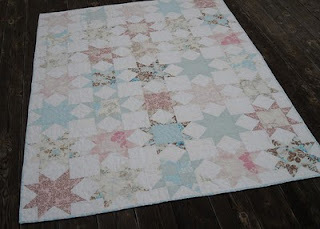 I finally get to post about Krista's quilt! 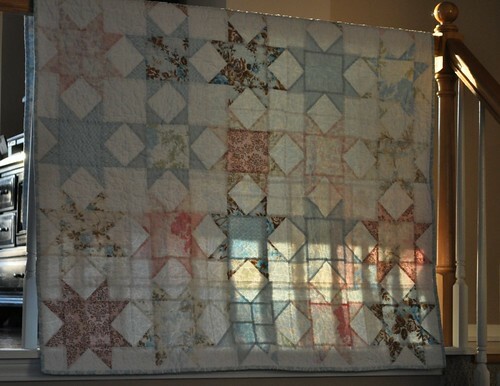 In January this year, the Elizabeth's Fabric Focus project on Sew, Mama, Sew was a lovely quilt made from the House collection of fabrics by Annette Tatum. As soon as I saw it, I knew I had to make my own interpretation for my sister-in-law Krista, who loves all things baby blue and many pink things too. Of course I had to change things up a little, and I decided to make my quilt with 10" blocks which wasn't one of the options provided in the pattern. That's ok, I can handle a little bit of quilty math now and then. 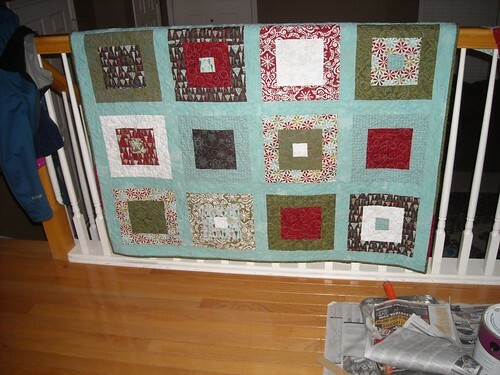 I got the fabric and worked on sets of 7 blocks at a time, taking big breaks in between. I finished it up in November after we got back for our cruise and labeled it right before wrapping and shipping our family gifts to Utah a couple weeks ago. 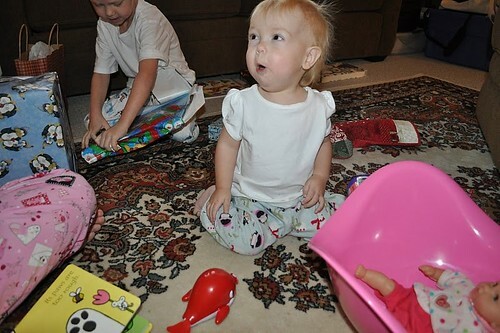 I was so excited about Krista opening this up, and I wish I could have been there to see her. 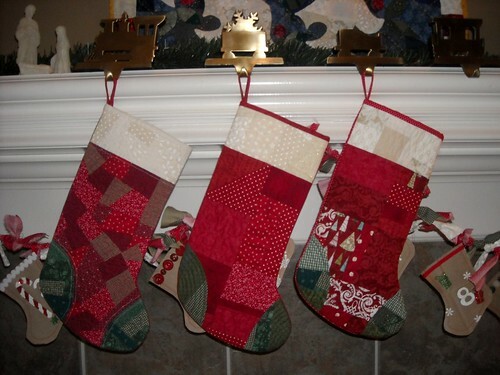 I'm trying to decide who I should make a Christmas quilt for next year! I like the stained glass effect here. Please notice the little pink chunk near the bottom. I really like that part. 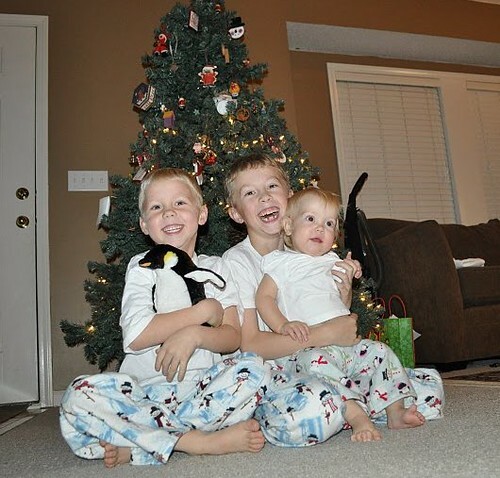 Had some helpers for this one, and learned that the flash can be a good thing sometimes! p.s. 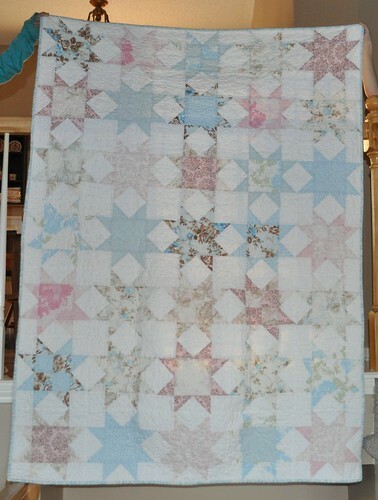 if you want to make this quilt with 10" finished squares, ending up with a 50"x70" quilt, you'll need 1/2 yard cuts of 10 different fabrics for the stars. 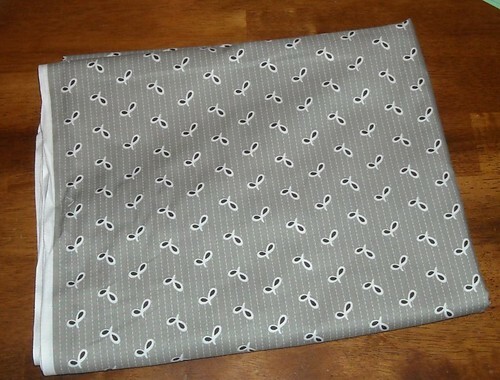 I can't tell you how much white fabric I used, because I didn't really measure it or keep track. But if anyone is interested, I can figure that out and I can also figure out the cutting measurements for the star blocks. I got the back finished for my Christmas quilt. 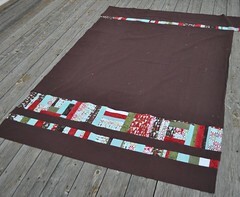 I like it and can't wait to get this quilt basted and quilted. 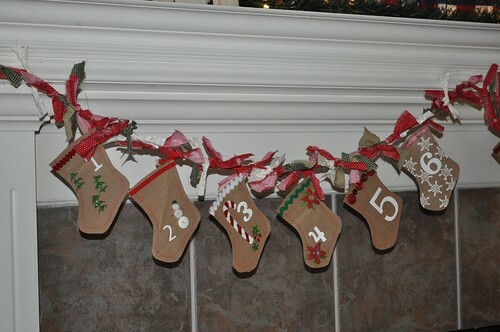 I finished my daughter's stocking; still deciding if I'll post the tutorial for it or not, it's getting a little late for that. 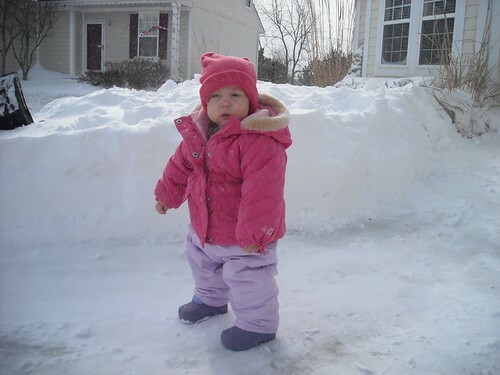 Besides, we have lots of last minute things to do around here! Hope you're having a good Monday! I'm off to help paint the living room. Sorry I didn't get to the giveaway until now. The winner is #6, L Johnson aka Laurel! Congratulations! I will be sending an email ASAP asking for your address. Fun, huh? I'm looking to swap FQs of this for other Flea Market Fancy FQs. Let me know if you're interested in a trade. Here's a little peek at what I'm working on today... in between cleaning and laundry and the school program and parties. I'm also going to do yoga this morning... Tara Stiles has some great yoga videos on her site or you can download them from iTunes, if you want. 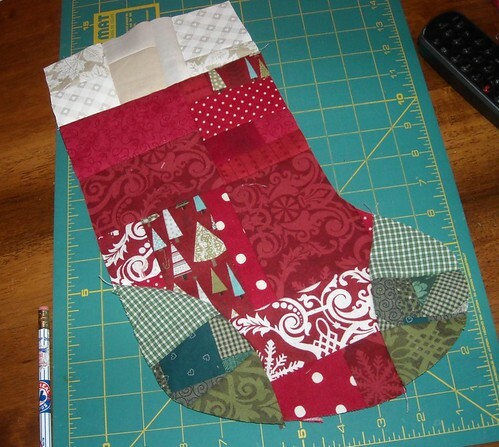 I'm going to get the stocking done as soon as I can and I'm also making a tutorial for it. 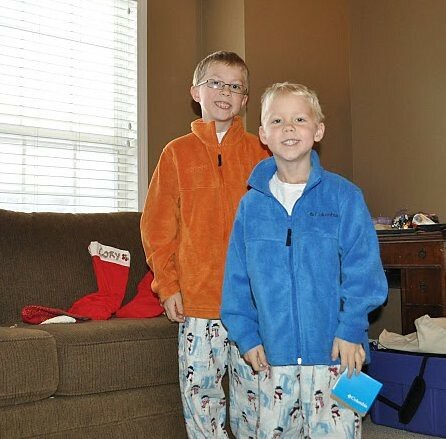 This one's for Lauren, her brothers both have stockings made from the same pattern but different fabrics. 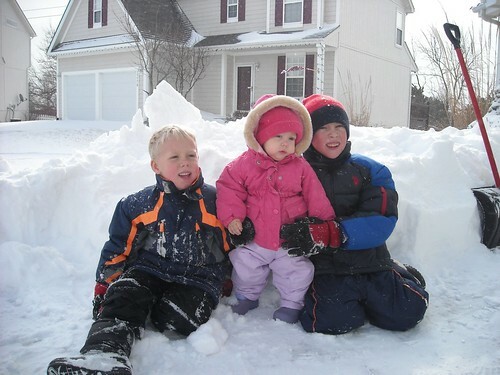 I'm a guest blogger at Park City Girl today! 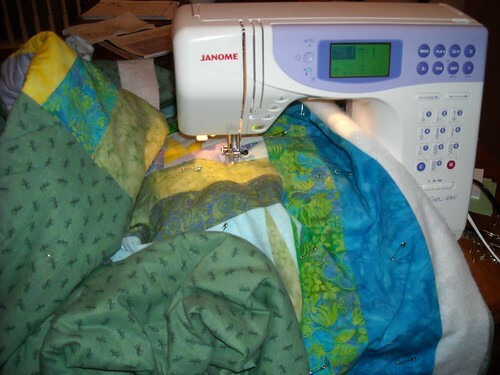 Click over if you want to see one of my early quilts and read about my sewing life. 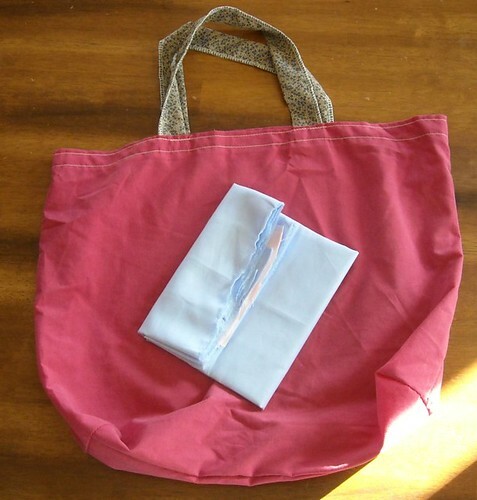 And, check back later on today for the winner of the fabric shopping bag! 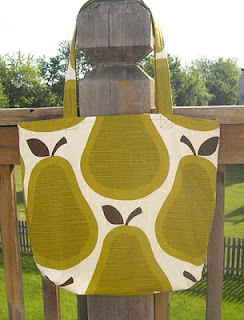 Inspired by this post over on Craft. Doesn't it sound so much cooler if I call it vintage? 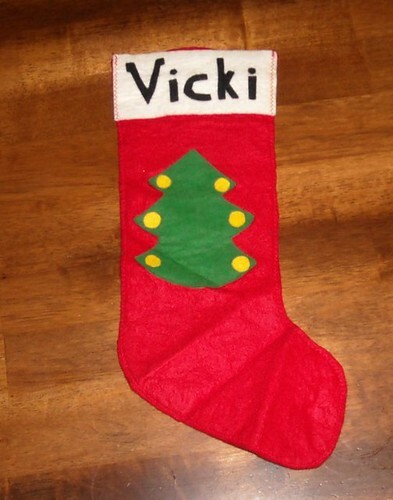 I think my mom probably made this (and similar stockings for my brother and sister) in 1976. 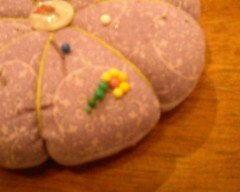 The felt is really soft, it seems different from the craft felt available these days. This stocking was the perfect size for an orange to fit in the toe. Also. There is a sweet giveaway opportunity over at Twiddletails. 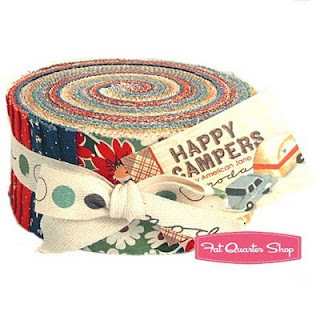 Five sets of 4 Wild Thyme fat quarters are up for grabs. 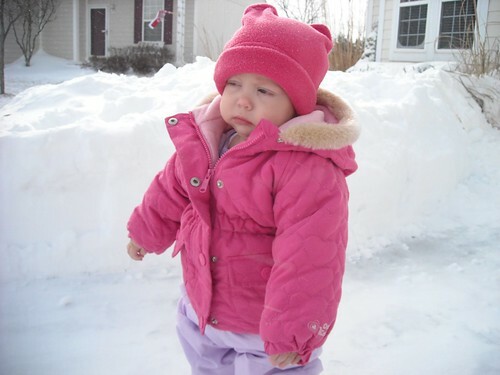 Go look, it's cute! 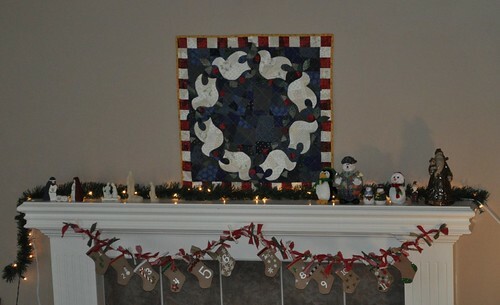 Thanks to everyone who voted for my Wreath of Doves quilt. I have 44 votes now (up from only 4 when I posted yesterday!) and I'm 5th place in the small quilts category. If I can get up to 3rd place or higher, I'll win a prize. If you haven't yet, please go vote for me! Top left: Drawstring bag. What is inside is a surprise. But the person it is for can't read and his parents already know that it is a whole bunch of Thomas duplo blocks and tracks. 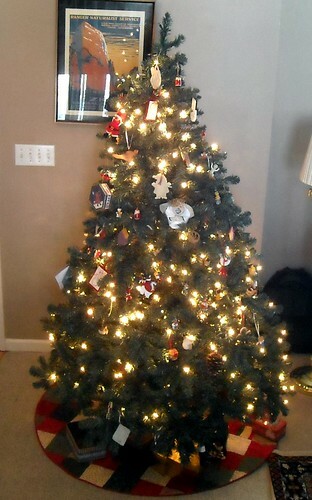 Bottom right: red and white gift. I might have to take another picture of it tomorrow in better light. It's really pretty. Bottom left: I love this one. The shipping box this gift is being sent in didn't have room for another boxed gift, and I didn't even have a box that would fit it anyway. I wrapped it in (yes, I'm blowing this part of the surprise, sorry) (like you couldn't tell by looking, anyway) a dishtowel that is part of the gift. I took more photos today that I'll be able to share in a couple weeks! One more thing--I recently entered my Wreath of Doves quilt in the Holiday Traditions Quilt Contest over at QuiltingGallery.com. Voting is open until the 16th! They are offering some fabulous prizes, and I'd love to win. 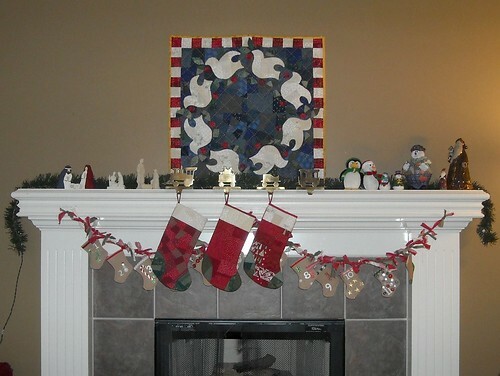 Please go vote for my Wreath of Doves quilt! 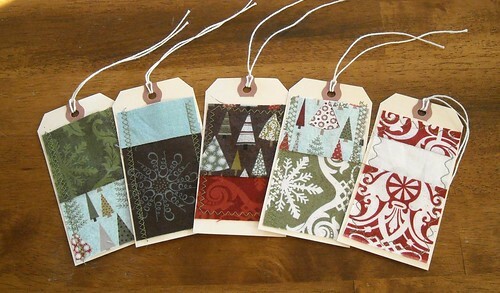 a set of 5 Figgy Pudding fabric gift tags. 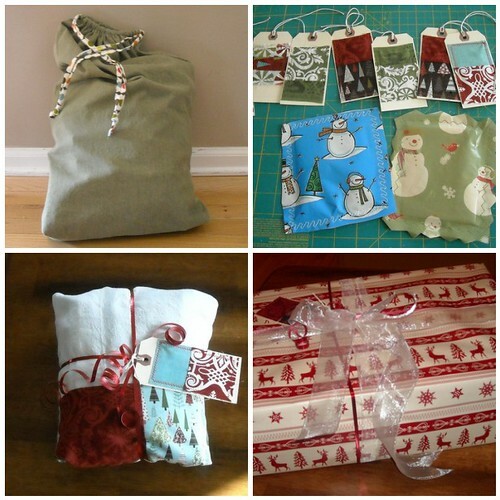 The fabrics are machine-sewn onto the gift tags with varied decorative stitches. 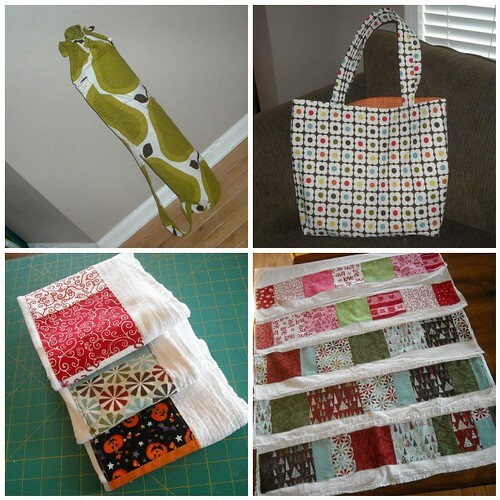 I'm also giving away this pile of scraps leftover from a couple projects I made this year. 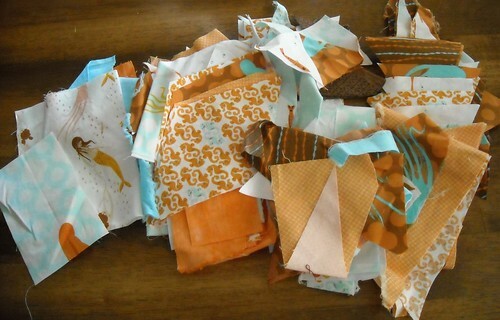 There are a lot of Heather Ross mendocino scraps, including seahorses, mermaids, octopi, kelp stripe, and swim class. 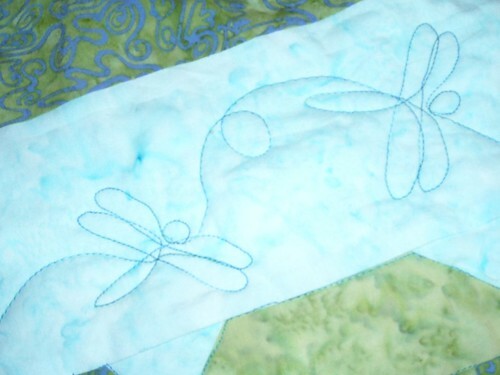 I am also including some hand dyed fabrics as well as a few other scraps of coordinating aquas, oranges, and browns. All you need to do to be entered to win is leave a comment on this post. 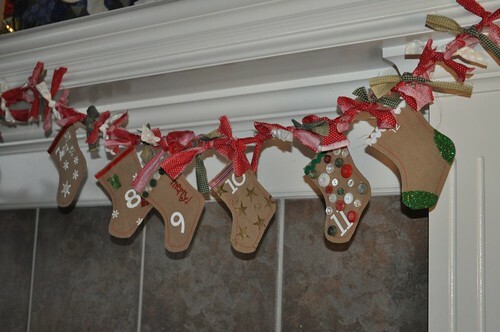 I'd love it if you take a minute to tell me where you are and what you're making this week. Or just anything about yourself. Comments will be closed sometime in the evening on December 6 and I will choose the winners with the help of random.org then. While you're here, take a look over there to the right and check out my tutorials. 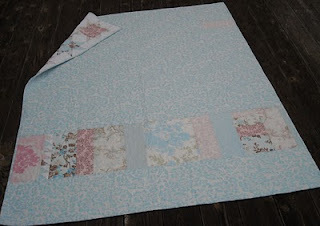 I have several quilting tutorials, including how to do quilt basting, free motion quilting, and binding. 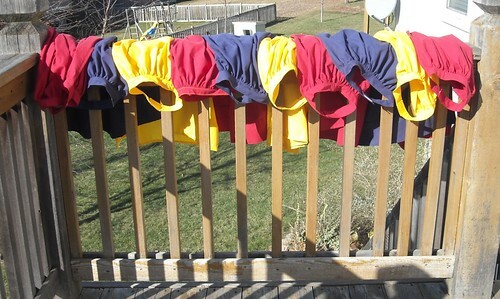 I also have a tutorial for making a t-shirt charm pack dress and easy kids' capes.